In astronomy, when matter moves away from an observation point, its light spectrum displays a redshift. A redshift is one type of Doppler effect. Named for Austrian physicist Christian Johann Doppler (1803–1853), this principle states that if a light (or sound) source is moving away from a given point, its wavelengths (distance between two peaks of a wave) will be lengthened. Conversely, if an object emitting light or sound is moving toward that point, its wavelengths will be shortened. With light, longer wavelengths stretch to the red end of the color spectrum while shorter wavelengths bunch up at the blue end. The shortening of wavelengths of an approaching object is called a blueshift. The first astronomer to observe a space object's Doppler shift was American astronomer Vesto Melvin Slipher (1875–1969) in 1912. His subject was the Andromeda galaxy, which was then believed to be a nebula, or a cloud of dust and gas (at that time it was not known there were other galaxies beyond the Milky Way). Slipher discovered that the spectrum of Andromeda was shifted toward the blue end, meaning that it was approaching Earth. Two years later, Slipher analyzed the spectra of fourteen other spiral nebula and found that only two were blueshifted, while twelve were redshifted. 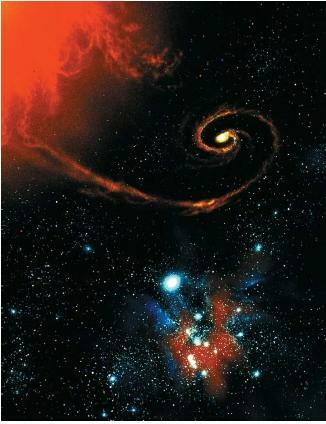 The redshifts he observed for some spirals implied they were moving at enormous speeds. Blueshift: The Doppler shift observed when a celestial object is moving closer to Earth. Doppler effect: The change in wavelength and frequency (number of vibrations per second) of either light or sound as the source is moving either towards or away from the observer. Redshift: The Doppler shift observed when a celestial object is moving farther away from Earth. Spectrum: Range of individual wavelengths of radiation produced when light is broken down into its component colors. Speed of light: Speed at which light travels in a vacuum: approximately 186,000 miles (299,000 kilometers) per second. An extremely important finding relating to redshifts was made in 1929 by Edwin Hubble (1889–1953), the American astronomer who first proved the existence of other galaxies. Together with his colleague Milton Humason, Hubble photographed distant galaxies and discovered that their spectra were all shifted toward the red wavelengths of light. Further study showed a relationship between the degree of redshift and that object's distance from Earth. In other words, the greater an object's redshift, the more distant it is and the faster it is moving away from Earth. The large degree of redshift in the spectra of these galaxies suggested that they were moving away from Earth at a phenomenal rate. Humason found some galaxies moving at one-seventh the speed of light. Hubble and Humason's research on redshifts led to two important conclusions: every galaxy is moving away from every other galaxy and, therefore, the universe is expanding. Thanks really helpful for my history of life class.